After years of rumors and speculation, developer 2K Games on Wednesday released a universal iOS port of BioShock, finally bringing the critically acclaimed first-person shooter to Apple's portable devices. As reported in early August, BioShock for iOS is a full port of the original game first released for Windows PCs and Xbox in 2007. Set in 1960, the game's protagonist Jack crash lands his plane near a gateway to Rapture, an underwater Utopia created by businessman Andrew Ryan. After discovering a powerful plasmid dubbed ADAM, the city fell into turmoil, creating roving bands of genetically modified inhabitants locked in a struggle for power. Blending frenetic FPS gameplay with role-playing elements, BioShock is driven by an intriguing storyline layered with philosophical undertones, the most influential being Ayn Rand's Objectivism. When the title first launched, critics lauded the novel application of decision-based gameplay in which a player's actions determine the story's final outcome. Biologically modify your body with plasmids - genetic augmentations that empower you with dozens of fantastic abilities. Control the world by hacking devices - reprogram enemy security bots into personal bodyguards, modify vending machines to change prices, and transform machine gun security turrets into powerless pieces of metal. Upgrade your weapons - Craft variants of ammo and plasmids by picking up materials in the city to modify them at kiosks. Explore Rapture - an incredible and unique art deco world hidden deep under the ocean, vividly illustrated with realistic water effects and cutting edge graphics now playable on mobile. Make Meaningful Decisions - do you exploit the innocent survivors of Rapture to save yourself...or risk all to become their savior? 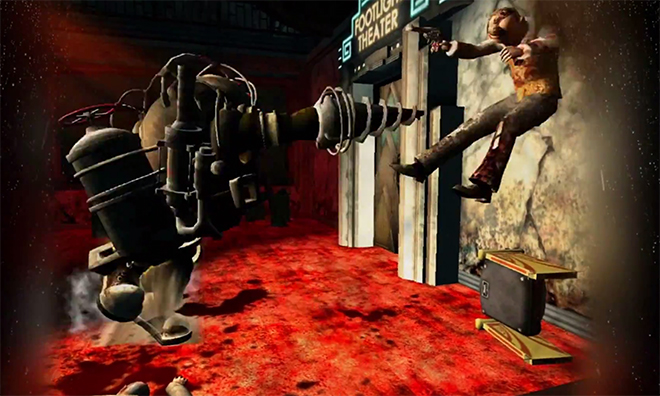 The FPS horror title spawned two sequels in BioShock 2 and BioShock: Infinite. BioShock comes in at a hefty 1.65GB and can be purchased for $14.99 from the iOS App Store. Due to processor-intensive graphics, BioShock is not compatible with the iPhone 4S or below, third-generation iPad or below, first-generation iPad mini and iPod touch.